Modern vehicles are fitted with at least one onboard computer. The computer's main function is to monitor and adjust the engine and transmission. Computer testing and diagnostics is an integral aspect to professional electronic work on modern cars. Computer diagnostics help find the root causes of major and potential automobile problems. 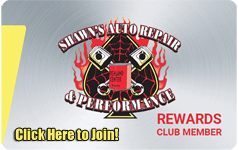 At Shawn's Auto Repair and Performance, we have state of the art computer diagnostics equipment such as digital code readers, pressure test kits, circuit testers, digital tachometers and more. Call 608-649-2886 or visit our auto shop in Richland Center, WI 53581 for all your vehicle's computer diagnostic needs.